On Friday night I took S and C to see Gravity at the cinema in Potsdamer Platz. It was in 3D and it was outrageously expensive, but we did it anyway because I couldn’t figure out if it would be in English at any of the other theaters where it was also playing, and for whatever reason, we needed a movie and a destination that night. 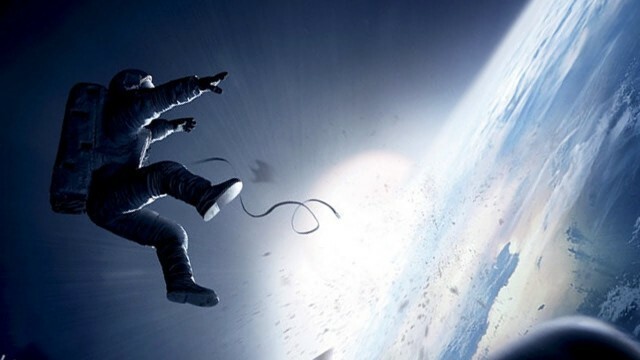 I won’t give anything away by saying that there are moments in the film in which we see the astronauts tethered to something or someone else. We also see them untethered. Watching it, I couldn’t help but be reminded of the visceral feeling that hit me when our family was on the plane heading to Berlin in August. We were on the first and longest leg of the flight, from Boston to Iceland, and somewhere over the Northern Atlantic, I felt it, a pull, as if I were on a tether of my own, like a kite on a string and the string leads back to the Twin Cities, and somewhere down in the bottom of the Mississippi is the anchor. I felt so strongly that I had gone quite far enough, and the plane was taking us further and further away, and it occurred to me that either this string is going to break because it’s being stretched to such a limit, or it’s going to rip my heart out. Which, in my mind, meant I would be homesick all year. This has become the defining question for me: Will I ever have the courage to let go of that string? I skipped rowing on Saturday morning and—is it possible?—found something homey and comforting by staying in. Back in St. Paul I would typically row early on a Saturday morning, probably about 7 a.m., so I’d be home by 10 a.m. Here, rowing doesn’t start until 10 a.m., and with the hourlong commute there and back, it’s usually after 2 p.m. when I get home again. This makes it hard to have any kind of Saturday morning routine with the family. But this weekend I was invited to row Sunday instead, leaving Saturday wide open. Saturday morning I woke up with the beautiful sense of a full weekend about to unfold before me. Just as I would at home on a wide-open weekend morning, I decided to make pancakes. I pulled out the recipe I had downloaded off the Internet in unfamiliar metric measurements. This was my second time making them here, and this time I was prepared with a bag of kuchen flour that had some gluten in it; the last time I’d made the batter with some other flour left by the last tenants, and it wasn’t so great. We don’t have any decent bowls in the flat, so I mixed the batter in a fondue pot. And then it hit me that we had nothing to eat them with—no syrup or even jam. Maple syrup is hard to find here, and if you do find it, quite expensive. A jar of good jam would suffice, and we’d used up the last of it that week. The girls weren’t up yet, or if they were stirring they weren’t yet clamoring for breakfast, so I had time to get changed and walk to the Winterfeldtmarkt a few blocks from our house in search of jam. It’s not unlike our larger farmer’s markets back in the US, combined with the best craft market you can imagine. Here you can buy fresh fruit and vegetables, all kinds of delicious bread, fresh flowers, handmade hats, scarves, sweaters, socks, purses, and jewelry; there’s the cheese man, the olive guy, the fish guy, there’s a woman who sells only potatoes, and there are prepared food stands where you can get coffee or cake or savory stuffed incredible-looking things. There’s a smaller version of the market on Wednesdays, but the full market takes place every Saturday—so I’ve barely been there since I’m usually rowing. I wandered through the stalls and finally found what I was looking for—a stall full of jams. I picked out a strawberry jam and headed back, though a hundred other things called out to me to buy them. You could do all of your holiday shopping there, I swear. Pottery, antiques, unique clothing, fun t-shirts, slippers, belts, toys, housewares… You could make a beautiful life out of just the things offered in that one square in our corner of the city every week. I returned to our flat, moved the iPod player in the kitchen, cooked the pancakes and ate them with the girls, slathered in amazingly delicious strawberry jam. We ate almost the whole jar. The girls were happy to have their comfort food again. At home I’d make waffles, but no matter; they seemed just as content to have simple pancakes. M doesn’t really eat breakfast, but I saw him eat one of the pancakes right off the platter. Then the girls wandered off to the other rooms of our flat to play, and I cleaned the kitchen, and everything about it made me happy. It suddenly felt just right to be listening to Joni Mitchell in the kitchen on a Saturday morning with the familiar smell of pancakes in the air. For once everything was in its right place—the time of day, the comfort food, the familiar music, all five of us at home and harmonious, with enough space for each of us to do our own things. I noticed the way the light hit the tree in the courtyard behind our flat, and I had the sensation that everything was coming together, and I let go, just a little bit, of that string I’ve been hanging onto so tightly, and tried to see what would happen if maybe I didn’t worry so much about the things I’m missing back home but instead focused on the good things that are happening right here, in my very own kitchen, in my very own life. This entry was posted in City life, Parenting, Sabbatical and tagged Berlin, Gravity, Homesickness, Joni Mitchell, pancakes, Potsdamer Platz, Winterfeldtmarkt on October 21, 2013 by Jill M.. Excellent post! I know how it feels to lose my “normal” and to miss it so badly. Congrats on settling into a “new normal,” even if it is just for a short season. I am really enjoying your blog — thanks for sharing your journey. Thanks, Jennifer! I wish you success in finding your own “normal” as well. Oh Jill…I think we still have a tether to the Cities! I know Merie does!! I like the idea of a really really stretchy one that you don’t have to let go of! I love the sweetness of this post – and that market sounds incredible! Mmmmm…pancakes! Merie, this is your kind of market. I wish you could see it. I will try to take some pictures. Chris, I’m glad to hear you guys can relate. I love this post Jill. Those days where everything falls into place are priceless. Even more so when everything is new and not yet familiar. Sound like you are hitting your stride.